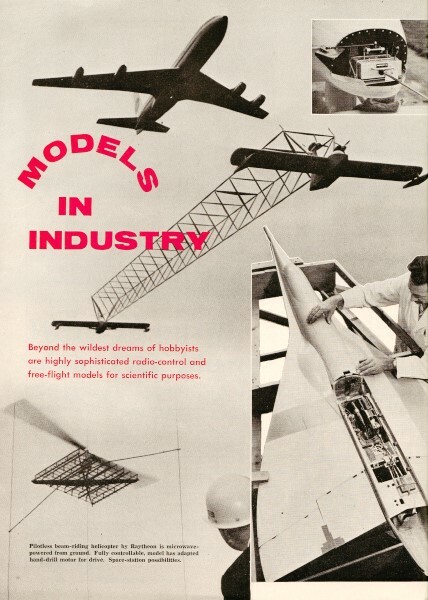 Here is a look at how models were used in the aerospace industry in the 1960s. How many of us would have worked for mere peanuts in the modeling jobs some of these guys had? It was not all fun and games, however. Lives, fortunes, and the fate of nations often depended on the skill of the designers and builders. 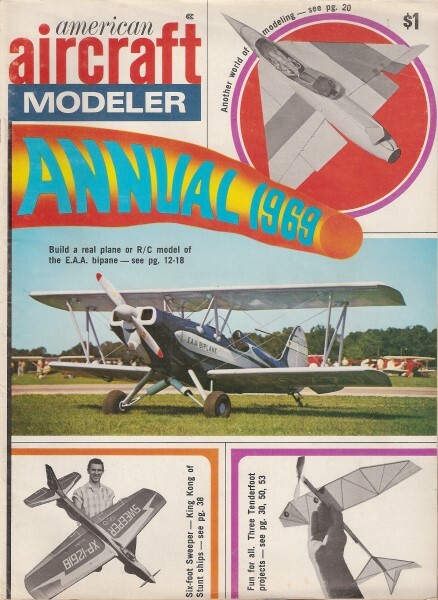 This article from the 1969 Annual Edition of American Aircraft Modeler takes an extensive look at the role of Models in Industry. There are lots of photos that have probably never been seen anywhere else. Beyond the wildest dreams of hobbyists are highly sophisticated radio-control and free-flight model for scientific purposes. SWINGING in the wicker basket of a captive balloon 3000 feet above the airship sheds of Cardington, England, a group of scientists from the Royal Aircraft Establishment fought back their dizzy nausea and pre-set the controls of a giant model airplane. Elevator deflection was for a stalled condition, with rudder to induce a spin, and a programed series of control movements to follow via servo action. Subject was the Gloster Javelin, prototypes of which had hit trouble with a big "T" in spin-recovery tests. Total losses of the then-new delta all-weather interceptor were no consolation to a worried Ministry of Supply when test pilots sought to discover the solution to what was a baffling aerodynamic problem. The answer was to come through models. Several 1/4th-scale dynamic reproductions were made to a "scale weight" of over 400 pounds. Cockpit affair on Land Rover enables operator to R/C plane-towed scale model. Aerodynamically-contoured supersonic escape seat flies like shuttlecock in high-speed multiple-image photograph made during test of plastic models in Southern California Cooperative Wind Tunnel. Pilot ejects supine, feet first. Frangible, dynamically scaled models protect tunnel turbine from damage. How's this for skill? Laurie Barr of Britain's AGM Models tackles vast range of projects, including scale turbines like one shown here. Not all modelers work in airframes. Advanced concepts of new aircraft can be comprehended by the study of models. Shown is Westland Rotorcraft display. Built by Prop Busters Club for the Institute of Atmospheric Study, 10-ft. push-pull R/C used for cloud seeding. Carries two 5-lb. silver-oxide flares to 15,000 ft. Merco 60, 49. Bud Andrews used Lanier Midget in wild life filming for Disney. Carries cone camera. Shot film for "What a Duck Sees." R/C models used by U. S. Forest Service gathered air data helpful in control of forest fires. Homed back to Tx. 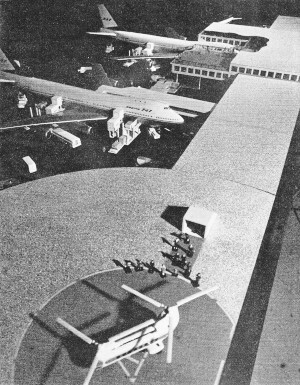 Airport model used by Boeing In study of loading and handling problems of the near-future Jumbo jets was built to 1/100 scale. Everything in the photo is built to same scale. Aeroclastic model of the Boeing B-52 employed to deter­mine structural properties of the design before it was built full-size. Model was constructed in scale to structural stiffness as well as size. Varying in-air conditions simulated. Airline display modeling a field in itself. This Boeing 707 and Concord produced by Tony Datkiewicz, Skyland Models, England, using Fibreglas, Oroglass and wood. This 1/24th scale 707B by Skyland Models for Air France, is fully equipped with every facility, except crew and passengers. Wind tunnel flutter model of Boeing B-47 was made to .015 scale from balsa and plastic. Aluminum skeleton at left weighs 9 lb., model 33. Members are machined to match stiffness of actual airplane structure. Lead weights added throughout model during tests to simulate altitude, fuel load, payload, etc. Plastic fuel cells filled with liquid simulate fuel slosh. Sometimes model makers run riot. 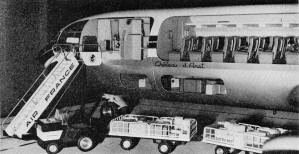 When British European Airways wanted a servicing dock for the Argosy freighter, the modelers went to town with a detailed visionary, including scale figures. Believe it or not, such a dock actually was made. This master female mold for a Concord model was prepared over a flat metal bench by craftsmen at Britain's R.A.E. Perfection in scale is demanded, and task takes many weeks. Assistant checks the parapack in a dynamic drop-model of the Concord. Droop-snoot is deflected for slow-speed tests. Rudder/elevon controls, epoxy structure, are foam filled. Technicians check large hatch areas on drop-test B.A.C. 221 at R.A.E. Bedford, England. The model weighed 120 lbs. Sectionalized view of the B.A.C. 221 model shows foam-filling in a Fiberglas-surfaced free-drop or wind tunnel version. 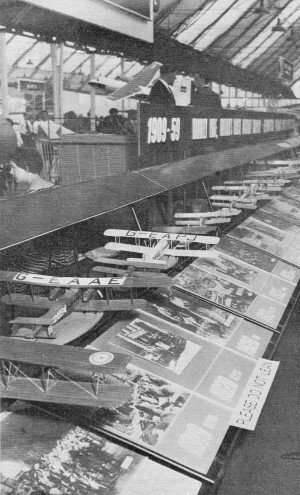 When Handley Page celebrated their 50th year, they produced a range of models to display 1909, to 1959 development. Displays a hit at Farnborough Air Show. Inside a "pro" shop. As many as 20 skilled craftsmen may be working on crammed benches. Production-line techniques. Jigging fuselage of drop-test Concord where changes asked for in nose area. Model research allows quick changes, results. Suspended beneath the balloon basket, then released into a spin, the whirling delta models were used to assess the effects of recovery control motions during the drop. At lower level, a barometric release tripped a chute for a soft landing. This did not work always, and a failure was spectacular! But nowhere near to spectacular as when the sought combination was achieved, and 400 pounds of free-flying steel and plywood headed beyond the range of tracking cam­eras, straight for the otherwise quiet Bedfordshire hamlet of Cople! Luckily, this high-speed glider managed to avoid all obstructions, and came to rest many miles distant. Crude though such tests may appear, and they date back over 15 years, they formed the basis of scientific research with models, which is still practiced by RAE in Britain and NASA wherever slow-speed condition demands investigation. Only changes in procedure have been the application of flight recorders and telemetry. 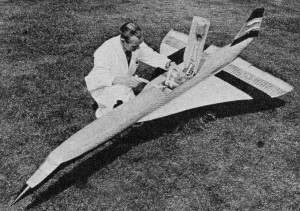 While British experiments are all pre-pro­gramed, many NASA tests use radio control for flight functions; but make no mistake, these models are far removed from the hobbyists' concept of a scale project. The average model of, say, 1/16th scale is something approaching one-tenth of the weight, and has less than a fifth of the power required for true dynamic reproduction of full-scale behavior. Yet despite this, many of the better scale contest entries display characteristics which are typical of the full-size. There is nothing new in this. Samuel Langley was doing the same in 1903 with his 1/4th-size models of the eventual flying machine; but the evidence gathered is scarcely more than a cursory assessment of behavior in flight. Tunnel models have always been utilized to offer the aerodynamic factors. Machined from close-grained timber, or in recent years, in steel, wind tunnel models are made to extremely close tolerances and, by means of designed breakdown, can supply answers to design variation effects relatively quickly. Yet the system still provokes a degree of mistrust. Tunnels call for model suspension. The interference of the support and even of the tunnel walls, and the difficulty of interpreting readings from small-scale, have often led to incorrect solutions. Thus, the free-flying model made to true scale in all aspects, has become a most valuable tool in research and development. Typical is work on the Anglo-French Con­cord supersonic jet airliner. Prior to construction of the actual prototypes, the one­time, world-speed-record-holding Fairey F.D.2 was converted with an "OGIVAL" wing (curved-leading-edge delta) of the same shape as Concord. 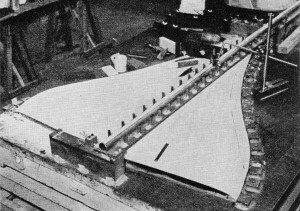 But before the F.D.2 could air-test the wing (now known as the B.A.C. 221), a free-flight model of this airframe had to be drop-tested. 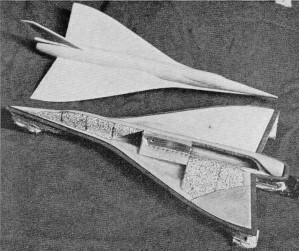 This in turn created a change in the model con­struction techniques, for the fuselage shell had to carry equipment weighing up to 25% of the total weight, and the wings, by virtue of their supersonic intent and desired ground impact resistance, had to reach a strength/weight ratio well in excess of previous experience. The answer came with molded epoxy­resin and glass-cloth assemblies. First, a wooden mold pattern of extreme accuracy was carved to tolerances of .001" including French polish finish. Next, "Titanite" exothermic-setting (heat generating) cement molds were made. This is a stone powder mixed with a magnesium chloride solution and, in order to avoid distortion, the mold is braced into a steel frame. Into the molds, layers of glass cloth and resin (Araldite) , coupled with a calcium carbonate filler, form a shell for the eventual model which will have cavity areas cold-foam-filled for rigidity. Components are then assembled in a precision jig, where metal fittings were added, and final work in the exterior is executed to bring the wings to a limit of .005" and the fuselage to .01". So from one set of molds in yellow pine, repeated test models can be produced fairly quickly. As the tests with the B.A.C.221 progressed, attention turned to Concord itself and it might well be said that the eventual shape of the tip deflections was determined by use of model techniques. These experiments employ a helicopter for release, when forward motion and ability to chase are a distinct advantage over those early balloon-drop tests. A very close approximation of the Concord flight envelope, especially at extreme slow speeds, will have been catalogued long before the French and British prototypes take the air. High-speed research employs models of a different caliber. Made to much smaller scale and propelled by solid-fuel rocket, the velocity is in the order of 1000 mph. At such speeds, visual observation is impos­sible, so the small model is equipped to telemeter measurements of pressures and accelerations from up to 20 stations. During the cruise (power-off) stage, a series of Kine-theodolite survey cameras record azimuth and elevation, and velocity is determined by radio Doppler. Such tests are used to discover pitching motions, divergences at speed, and stability. Scientists are concerned only with the aerodynamic shape, so the weight problem does not arise. Machined in steel, and sometimes carrying further small rockets to fire at intervals to provide an oscillatory motion, these supersonic free-flight test bodies are way beyond our concept of general modeling. Far more understandable is the drop testing of a revolutionary new shape, such as the Rogallo wing or a lifting-body vehicle for spacecraft recovery. Standard model airplane techniques have long been employed at NASA in this kind of experiment. Models of up to 230 pounds have been dropped from a helicopter at 4000 feet, prior to deployment of a Rogallo-type Parawing. These lifting delta-shape chutes are controlled in descent by use of center­of-gravity shift actuated by standard R/C equipment. Precision has been such that landings have been positioned within a 20- ft. circle. Robert Reed, Head of Advance Planning, Reentry vehicles NASA, Edwards, reported most favorably on use of aeromodeling methods in this important research field to an Astronautics Conference at L.A. last March. He also revealed use of a "Carrier" model, 10 ft. 6 in. span, and 8 ft. 3 in. long, which was designed to air-launch up to 20- lb. payloads though its own weight was only 15 pounds. Two 60 engines on a tee-bar nose mount are enough to thrust the monster to height before digital R/C auxiliaries are triggered to release the experimental parasite. This could be any of six reentry bodies ranging from a 6-ounce lightweight, fixed-control, slender lifting body of Silkspan-covered balsa, to a 40-in.-long 10-lb. 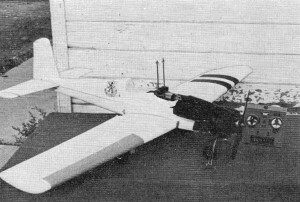 Fiberglas scale M2-F2 with a pop-out Parawing in a bag attached to the carrier. As the M2-F2 parted from the mother model, a static line deployed the 90 sq. ft. 'chute. It's interesting to note that where extra power was considered necessary, for control drive, particularly on the heavy sleds dropped from the helicopters, R/C servos were used to trigger surplus-aircraft cowl­flap actuators by simple mechanical-electrical microswitch unit. Such studies offer low-cost, minimum risk examination of basic problems in research and are by no means limited to government establishments. The Sandia Corporation of Albuquerque has saved itself lots of time and money thanks to the modeling experience of Dan Parsons. Dan is a Sandia supervisor engaged with the company's tracking telescopes. He conceived the idea of using R/C models for telescope tracking practice to accustom the operators to the skillful task of observing high-flying jets. After initial demo's proved that realistic tracking experience could be gained from models, Sandia contracted Ted White to produce planes and equipment. 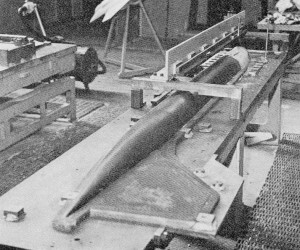 Drop tests of dum­my bomb shapes, involving a study of target colors, are another aspect of these experiments with the 6-ft., 7-lb. models which use 60 engines. A development is carriage of telemetry equipment to relay model-borne instrument readings as the small plane is guided 1500 feet above an explosion. Blast pressure readings would be difficult to obtain by any other method. There is also another tremendous advantage in use of models in that they are not subject to Air Traffic Control, can conduct up to 18 short-stage missions per hour and, above all, are under complete control of an operator within direct voice contact of the experiment supervisor. One of the relatively big surprises in the successful tests has been the instant response of the model to the operator's signals. The excellence of modern radio control is always a source of wonderment for the uninitiated, and the quicker witted in the business field have soon discovered the hidden potentials. One of these is the airborne cone camera for wild life filming. Bud Andrews of Northridge, Calif. took a Lanier R.T.F. Midget off to Alaska and captured 1200 feet of film from a duck's eye viewpoint. Stock Kraft R/C, and only apparent modification in the vertical rails for camera mounting above the cockpit area were employed in the Walt Disney Productions mission. Subsequently, Bud went to complete the filming in Florida for "What a duck sees." It should be worth watching the movie theater ads for this one. And while on the movie deal, let's say here and now that there's an upheaval in the special-effects depths of the 70-mm film world; but they don't want us to talk about it! Gone are the days when model planes slid jerkily along stressed wires in a studio. Crash shots with all the blast in the wrong direction and obvious studio break-ups are back in the past. So successful is the new style use of R/C scale before the cameras that the policy makers reckon they'll maintain a deception that it's the real stuff they're flying. All we can say is that when your screen carries two Ju 87's in spectacular mid-air collision, filmed in 1968 when there's not been a single example flying anywhere in the world for 20 years, what else could one possibly imagine has provided the spectacular? And this is only the beginning. As art directors develop the technique, whole new fields open up for action scenes of extreme realism. They have in fact, been rather slow, perhaps due to lack of contact, in adopting R/C to film techniques. 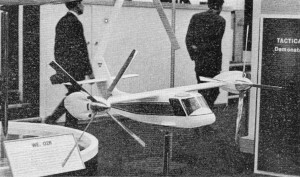 More than 15 years back, Consolidated-Vultee was checking out their R3Y-1 Tradewind flying boat in radio-controlled model form. Object of these tests was primarily to ascertain hydrodynamic characteristics and changes to the planing hull could quickly resolve problems of spray effect, or water-planing which would otherwise only be determined the hard way. A colossal 1/10th-scale XP5Y-1 of 14-ft. 8-in. span with four 2-hp. horizontally-opposed twin-cylinder engines was flown at San Diego. We wonder whatever became of such an advanced model? All control surfaces were employed, including flaps which were in no less than six separated panels. Convair became famous for its model section and, like all other airplane manufacturers maintains an active department. 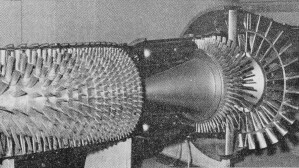 They also created a 'break-through' in automatic tooling of metal wind-tunnel models during the development of the thin­wing F. 106. Magnetic-tape-controlled pro­filing machinery, working from data produced by a Numerical Control Group, effected a saving of time amounting to months when compared with manual preparation of fine-tolerance 1/20th-scale wings. 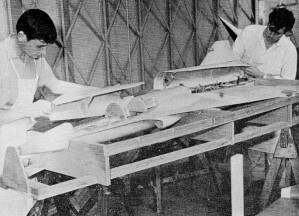 Another aspect of model research by Convair has involved mechanically actuated models in a wind tunnel for filmed observation of crew escape systems. The rocket-propelled shuttlecock action ejection seat, which tilted the pilot back in his seat before leaving the cockpit in emergency, was first tested with scale models before full-size experiments at Edwards and on the track at Hurricane Mesa, Utah. This confirmed seat stability during the vital post-ejection stage. Lockheed's model department is also famous for its achievements. 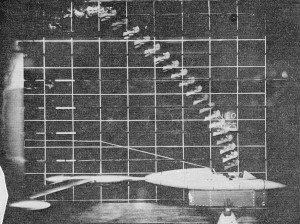 The solution to the early problems of the Electra after disastrous wing failures was discovered through models of scale elasticity in structure. More recently, the Lockheed seaplane conversion of the C-130 Hercules has made news. "With representatives of the U. S. Navy Air Systems Command watching, a six­foot-long model of the C-130 Hercules ­ configured as a seaplane - has taxied out on a lake, taken off from, and landed on water," stated the Lockheed-Georgia news release. The tests were made to study the feasibility of a 175,000-pound propjet Hercules airplane for amphibious operations. 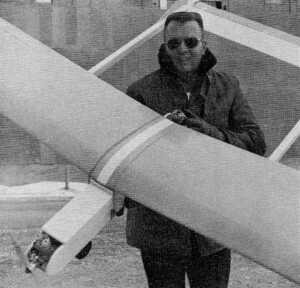 Jack Dunn, Lockheed-Georgia Company test pilot and avid model airplane enthusiast, flew the model by remote control. He said he was more than pleased with the water handling and aerodynamic characteristics in takeoffs, landings, and in flight. The amphibian model was built by Lanier Industries, Gainesville, Ga., has an 8-ft. 3- in. wingspan; is powered by four Super Tigre engines; and is made of Styrofoam and laminated plastic. It weighs 32 pounds. As a result of this model test program, Lockheed proposes further studies of tests and then modification of a Navy C-130 Hercules into the HOW configuration for full logistics and amphibian air-rescue operations. The land-sea HOW airplane would be fitted with an aluminum hull extending from the nose over 66 feet along the fuselage underbelly. For water landings, the aircraft would depend on a single retractable hydroski ­ a U. S. Navy development. Most of the models we have described so far are to true scale in practically every department except one, and that is in the flexibility of the structure. For free­flight tests, this is unimportant. But the manufacturer has to know what is likely to happen at varying speeds and altitudes and changing temperatures. Boeing, with their long-span, high-aspect-ratio swept wings, especially on the military B-47 and B-52, had to insure full control of any flutter tendency. In order to determine the flutter characteristics, an aluminum spar was designed to have identical stiffness, or flexibility which ever way you look at it, as the full-size. For an 88-in. 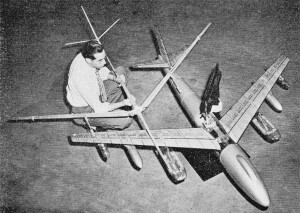 model, the spar and fuselage attachments weighed nine of the total 33 pounds and the wing was so created that panels could be loaded to simulate varying conditions. Those who've seen the curve in a real B-47 wing will appreciate how true to life were these vital model tests. Much more recent is the Boeing SST Variable Geometry project, eventually discarded after tremendous investment. Who is to know how much of a part the 1/5th­scale dynamic wind-tunnel model played in making Boeing decide it was no-go on this one? 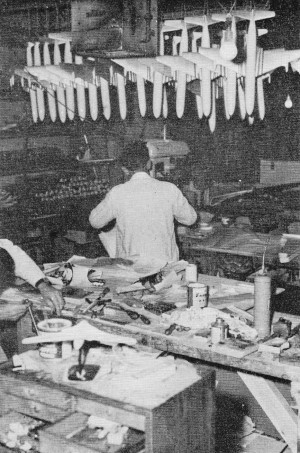 For every aircraft design in production, any manufacturer could show a host of discarded projects in the shape of tunnel models. But this, the "big-one," went further along the line than most. Boeing's model probably cost more than the purchasing price of a 737 airframe and, in view of the decision to stop the design, has obviously saved them from entering a difficult market with a dubious project. 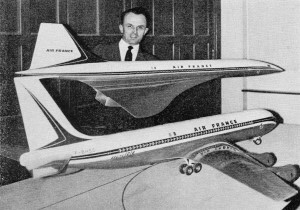 Their SST model was certainly bigger and apparently more involved than any comparable model of the BAC-Sud Concord. Pilotless beam-riding helicopter by Raytheon is microwave-powered from ground. Fully controllable, model has adapted hand-drill motor for drive. Space station possibilities. Just as a model can direct the future of a company in averting errors so, too, can it suddenly thrust untold opportunity into a manufacturer's hands through R & D results. Raytheon has been working on transmission of microwave energy radiated from the ground up to a helicopter. 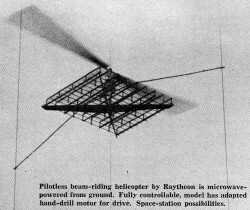 Sponsored by the Air Force Development Center, Rome, N. Y. the Raytheon experiment achieved world-wide fame when, in October '64, they publicly demonstrated a microwave-powered helicopter. Subsequently, papers by William C. Brown, manager of the operation, reveal that the 6-ft. 4-in. diameter rotor has full pitch-, roll-and yaw-axis stabilization and can keep accurate station through control by an unmodulated microwave beam. This model weighs eight pounds, less antennae, 3-1/2 pounds of which are involved in the auto­pilot system. The drive motor is said to have been adapted from a standard 1/4-hp hand drill from a hardware store, offering something like only one horsepower per eight pounds of weight. Obviously, there's room for a lot of stretch in development. The very fact that the pilotless helicopter model is a possibility is in itself great news, especially to modelers in the U. S. and Germany who have been chasing the impossible for so long. Ultimate potential of the beam-riding helicopter is its employment as a TV relay station or satellite at high level. Power demand for the transmission system is claimed to be low with gross cost of operation at $40 per hour. With the goal of a space platform in view, the microwave helicopter model thus opened up an entirely new field in science. Mechanical design of the swashplate assembly on the rotor head would also make the hobbyist helicopter fan green with envy. 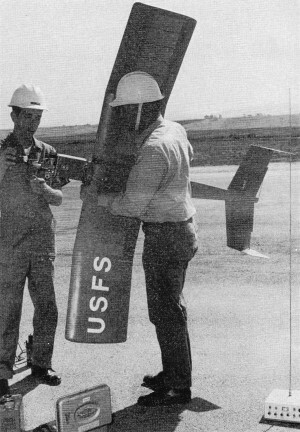 This part weighed one pound, about the same as the rotor itself which was Mylar-covered balsa, attached to an aluminum spare. When industry applies its own know-how to specific problems, it can often reverse the flow of ideas back to amateurs, and here we appear to have an excellent case of help for the helicopter men. But in our experience the passage of ideas, is more often in the other direction. In many big plants, the management have discovered among their personnel a modeling enthusiast, skilled with his hands and ingenious in his ways. They might need a visual presentation of something which the board of directors would never be able to conceive from engineering drawings. Mostly, they need to know how to plan their plant, and to control the productivity from machines. So in a thousand or more cases around the world, top management has a scale model of the plant. Simple card shapes are the usual rule. But some, like the Goodyear Tire & Rubber Company, have detailed layouts to precise scale. For 20 years Bill Tisen maintained the Goodyear model display program, which covered all the manufacturing, operating and office networks of this worldwide company. Laid out to 1/50th scale, and including the famous Goodyear blimp hangar at Akron, Ohio, Bill's models could present an immediate impression of the Goodyear empire at a glance. In other factories we've seen scale presentation of aircraft assembly, machine disposition and even personnel evacuation planning. The value of such models is identical to that of the architectural planning model which can illustrate the finished product before it is ever actually started in construction. In the airline world this need for visuals has created an industry of professional model makers engaged in production of sleek mini-liners for the travel agencies of every nation. Plums of the trade are the 1/4th-scale "sectionals" where an Oroglas or Plexiglas fuselage is left only partly painted to show the cabin interior. When re-equipment of an airline involves an entirely new type, the model suppliers have a boom on their hands. Current demands are for 737, 747 and Concord, but there's still a lot of other equipment around. Plastics feature largely in this business. Wings of epoxy-Fiberglas, or styrene moldings with transparencies for the fuselage and solid wooden tail surfaces. The smaller fry are all styrene, vacuum-formed or injection molded in a one-piece assembly and decorated with special livery decals. It is not entirely unknown for an airline to adopt the livery created by a modeler for a prototype model! Another aspect of this busy trade is that the majority of the modelers involved are one-time aces in the competition area of hobby modeling, but few manage to find time now to continue what was once their all-consuming pastime. Sound familiar? When a full-scale aviation show is planned, such as the Paris Aero Show or Britain's Farnborough, these modelers come into the most interesting aspect of the show. They alone have the responsibility of con­veying to the public how good are their companies future projects. Models may appear up to three years before actual aircraft make first flights, and their surface finish, shape, cleanliness and presentation are critically important at Le Bourget or Farnborough. It's almost like a war of models sometimes, though those days are passing rapidly as the aviation industry kills off its internal competition. The pressure on the modeling groups prior to one of these big aviation shows is terrific, and in many ways this demand epitomizes the value of models in industry. There's a place for modeling in every manufacturing establishment, and opportunity abounds for the hobbyist who is genuinely skilled in his craftsmanship, adaptable in his interests and adventurous in his modeling techniques. (Top) An8 ft. 3 in. 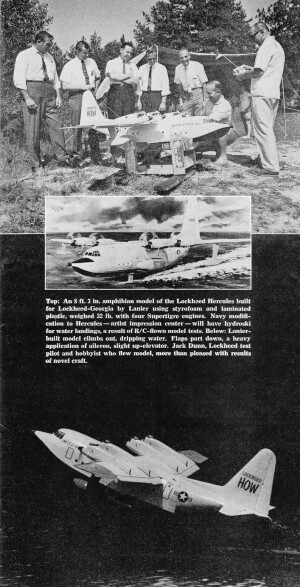 amphibian model of the Lockheed Hercules built to Lockheed-Georgia by Lanier using Styrofoam and laminated plastic, weighed 32 lb. with four Supertigre engines. (Center) Navy modification to Hercules - artist impression - will have hydroski for water landings, a result of R/C-flown model tests. (Below) Lanier-built model climbs out, dripping water. Flaps part down, a heavy application of aileron, slight up elevator. Jack Dunn, Lockheed test pilot and hobbyist who flew model, more than pleased with results of novel craft. 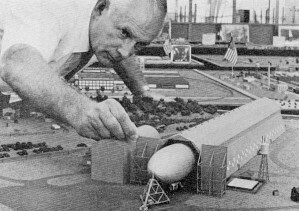 Goodyear scale-models all their facilities. This craftsman is checking the doors on blimp hangar at Wingfoot Lake, Akron. 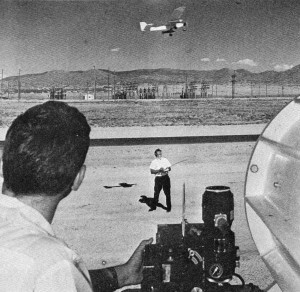 Sandia Laboratories study of resolution of color and black-and-white film involves drop of vari-colored bombs from R/C model flown past scope camera by Ted White.